This is my girl. My wife knows this lady is my life. She agrees. My passion for 2 wheels, gets me excited in reigions very few men can experience. If it was able to stand next to my side of the bed at night, it would. Took my wife 27 practice mounts, before she knew how to swing her leg over, without kicking the tail piece. I hate when people mount up behind me and i hear a shoe kicking the tail piece. Rather kick the exhaust or wheels. Dreamt of having her to myself for 15yrs. Finally able to afford her 3 weeks ago. Been privilaged enough to say, i rode almost every make of sled on the road, but Yamaha stays tops. nice ride! bit fast for me as i can be a speed demon at times. happy with my wr250x with 10000 mi on the clock atm. 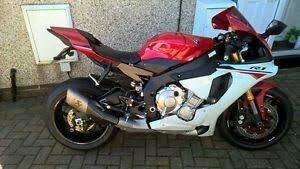 cannot wait to get it back as i have it in getting the shock/forks freshened up for the 1st time. I am a speed demon since my conception. Haha. Dad did stock car racing.